Studying for hours and hours preparing for exam is the most common thing that students have to go through to get straight A’s. However, it may not be as easy as it sounds. It requires a lot of effort, dedication and the right materials to achieve the goals. Therefore, we have proposed some beneficial ideas and techniques that will help you overcoming these hurdles and difficulties so that you can be more productive and stay organized. Recording lectures is the most helpful way to study. Every time you sit in a class, turn on your recording device. That way, you can focus and pay attention to your professors without having to take note of each and every one of his words. In addition to that, you can always replay the recording after class to clarify more about things that you didn’t fully understand during class. Although it is not usual, some colleges or professors may not allow students to record the lectures. So make sure you ask permission first before you record the lectures. Taking notes is a common thing that university students usually do. Although you may already record the lectures, you may still need to take notes for some reasons. For example, you still need to take mathematical notes. You are also required to write equations or math exercises to be able to participate and solve the problems in class. If you are not allowed to record the lectures, you can always transcribe it. To make it easier, you can organize a group with other students. Each day a student is responsible for transcribing the class, writing down the most important points. The students can discuss the notes after class. That way, the rest of the students can attend class without having to take notes. In case the transcriber has been lost in some fundamental part of the lectures, the others can help him elaborating the notes of his class and complete it. To understand the concepts of the subjects and notes taken in class, you are required to study comprehensively through the textbooks. It is also useful if you read your textbook before going to class so that you will understand the lectures better. It’s recommended that you read annotations and comments at the bottom of the page to get additional information about the subjects. You can also find more information from bibliography of the book. For example, you can search the title in the bibliography on the Internet for more information. Students are required to expand their knowledge by reading a lot of books, journal articles and magazines. If you don’t find the desired information, you can go to reputable websites and other online sources to get information. You can also search for information from related blogs or community mediums making sure that these are trustworthy sources. Educational videos are beneficial for students. If the study agenda is something abstract or not appreciated by the human eye, videos and images are very useful to understand what is being studied. On YouTube, there are channels of trademarks or official bodies that are responsible for resolving doubts, especially in scientific agenda. Conceptual map is used to organize and structure knowledge helping you get clear ideas and to correlate concepts. You use diagram or graphical tool to illustrate them. To do this, it is recommended to use a sheet of size A3 or paste several sheets of A4 size in a row, thus creating a more comprehensive and accurate map. Then, use any graphical software such as Microsoft word, Inkscape, Vectr, etc, to create the graphic and diagram. You can stick this map in front of the study desk or as close as possible so that by looking up the text and the indexes of each topic; you can have an overview of the entire agenda, making your study hours organized. 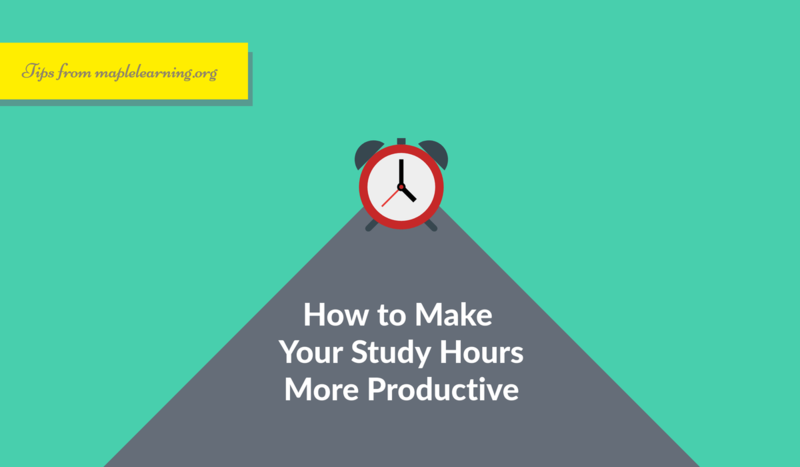 These are few study tips that will help you make your study hours more productive and organized. If we miss some important points, don’t hesitate to let us know by leaving a comment below. Lara Hawkins has completed her Master’s from a recognized and reputable university in the States. She is providing online custom assignment writing and produces content which is exquisite and altered as per the need of the employer. She looks forward to write a fiction novel in the near future.